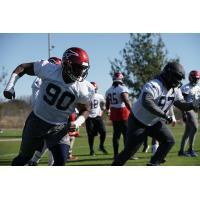 - Following two days of joint practices on Thursday and Friday, the Memphis Express went through a padless practice at S.T.A.R. Soccer Complex from 10:15 am to 12 pm on Saturday. - Saturday featured the windiest conditions of training camp thus far. The coaching staff used the day to make adjustments in 7-on-7 and 11-on-11 work after studying the tape from Thursday and Friday's scrimmages. - CB Kadeem Satchell (Emporia State) reeled in an interception during 11-on-11s, tracking down an errant pass that sailed the intended receiver going over the middle. - WR Fabian Guerra (Fairmont State) kept up his push for a major role in the offense, securing several receptions through the morning despite strong winds making the passing game difficult. Guerra's performance this week comes at a critical time in camp as the depth chart rounds into focus. - Head Coach *Mike Singletary *delivered strong words to the team at the close of practice, stressing the importance of next week as the final cutdown approaches on January 30. Singletary asked for effort levels to rise in order to help the coaching staff make its tough personnel decisions. - Head Coach Mike Singletary on getting the team a breather following two joint practices: "I wanted the guys to know that we're trying to get somewhere, to do things the right way. At the same, with them in mind, we want them to get their bodies back, and give them a chance to think about where they are, the things they need to do to get better, and ask questions of the coaches." - Head Coach Mike Singletary on improvements between the first and second weeks of training camp: "I told the guys early on that I think the team is going to have success if we come together earlier. I think the camaraderie amongst the team was the number one thing that stood out the most to me this week. I saw guys step up and all of a sudden it's slowing down for them. We're going to get more of the same this week. Monday and Tuesday we'll grind from sunup to sundown. On Wednesday, we'll transition to thinking about Salt Lake a little bit, get our legs back, and get ready for the storm." - Head Coach Mike Singletary on the mindset approaching cutdowns: "I really want our coaches to be more demanding of the guys in terms of the technique they've been teaching. We have to have that. If we're not seeing it on film, then we need to make some decisions about who we have. It's hard to not get attached to your guys and be pulling for them at the same time. We have to turn that switch and have the guys here that are doing it the way we're asking them to do it."